Usually when a game tells you to hit start to begin, you’ve already got your thumb raring to go. But, the best thing about the more retro games is that patient thumbs are actually rewarded. If you hit that button too fast, you might miss out on the game’s most awesome quirks - the start screen idle animations. Sadly, such treats are far less commonplace nowadays, especially as they were originally used to tempt customers at the arcade. After all, why would a game need an “attract mode” nowadays? If you’ve got to the start screen, you’ve already bought the game and definitely want to start playing straight away. But let’s not forget the forgotten art of the attract mode, the beauty of the start screen, the cute animations that got left behind. These are the games that are even more awesome when you don’t push the start button. The Start Menu screen for The Last of Us is beautifully minimalistic. It’s just a window with the curtain moving softly in the breeze, and dust particles dancing in the sunshine that streams in. The scene is such a contrast to the apocalyptic horror within, the only sense you get that something is amiss is the knife propped in the window and the way the flora has crept into the home. Don’t even get us started on that music either, it’s stunningly haunting. Nothing looked as good as the intro to this game. Nothing. It starts off dark (pictured), with only lightning flashes and the outline of a fighter. The lights come on and a screen-filling Ryu sprite scowls into the camera. The Turbo edition may have added Chun Li and Cammy (the latter poking her tongue out for no obvious reason), but that only diluted the simplicity and drama of this original version, which concludes with a first person rendition of what it looks like to have Ryu throw a Hadouken fireball at your face. Cue the electricity around the title logo and the prompt to push start/insert coins. HAVE ALL MY MONEY. After an eight year wait between games, Metroid Prime was quite the sight for eager fans and it blew our tiny minds right from the opening moments. Gone was the side-scrolling Metroid of old, replaced with the first 3D Metroid ever complete with amazing secret attract mode that showed Samus as a fully 3D rendered, physical being jumping right into shot. We had to pick our jaws off of the floor. Super Mario World’s fantastic start screen may be a short gameplay loop, but number of memories it’s been ingrained into must be uncountable. The emergence of Yoshi from his egg, the apple-eating, the multi-coloured koopa shells and then the iconic one-segment-at-a-time eating of poor Pokey. Just how many times that little guy has been eaten over the past 26 years, just for our chuckles, we dread to think. But, we’d still watch it a few more times yet… We just wish it was on the Nintendo Classic Mini: NES. Now we know we said the art of the attract mode is dead, or at least dying, but Call of Duty: Black Ops totally gets it. The game boots up and you’re in an interrogation room, strapped to a chair, with your captors leering at you through frosted glass. Machines whirr around you and you can even struggle in your seat as the various game menus pop up around you. Nothing screams tension and espionage like a good interrogation room. This is probably the most beautifully understated Start Menu idle ever. With its haunting melody, lazy evening light and simple scenes of Link riding Epona across Hyrule Field, it doesn't really have much 'action' at all. If anything, it gets even more understated as it progresses, seeing Epona pawing at the ground by a river. Sure, you get a prancing bit (pictured) but this is the intro of a game that knows it doesn't need to show off, because you’re going to play it anyway. And this intro didn’t lose any of charm when it leapt onto 3DS in 2011 either. The original Time Crisis looks pretty dodgy these days. But the intro does the best it can with the crude 3D that was available at the time. It's got explosions. It's got Hollywood-style freeze-frame close-ups. It's got... some guy with a ham over his left eye (or similar - we still can't tell exactly what it was supposed to be). But it's also got this dude, who goes to run his fingers through his hair, then... BOOM! He's pulled three throwing knives from his bouffant. Amazing, and still memorable all these years later. Ya ya ya ya ya! And so, with a jump cut for each of Dexter Holland's yas, the craziest of all the taxis zooms into view and straight into your heart. The blue skies, the 60fps frame rate, the phone booths and crates flying everywhere its Fun, Fun, Fun by the Beach Boys in videogame form. "She got her daddys car and she cruised through the handburger stand now". May as well have been singing about leading lady Gina. And by the time the demo taxi is leaping from the second floor window of the multi-storey car park, you're already hoping it'll pick you up for a ride. The intro to 2000's first truly 3D Resi game must have cost a lot of money. A LOT of money. It's a CG render with previously unseen production values. 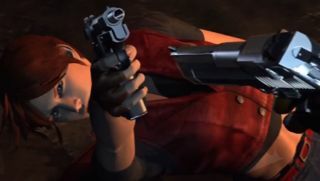 Claire Redfield gets chased through a facility first by guards, then by the bullets from a minigun-equipped helicopter. It's reminiscent of Terminator 2 and equally ace. Then there's the fake surrender, fiery explosion and lock of hair falling across her face in this stalemate... It's exemplary. Funny how the quality of the CG gets worse the further you get into the game, even switching from this high-detail version of Claire to the in-game model in the same CG cutscene. But hey, we'll always have this intro. You know you're in for something special when a game begins with a cinema rating card lookalike. And something even more special when a 'down the gun barrel' James Bond intro begins, just like in the movies, with a virtual Pierce Brosnan shooting at you in impeccable motion-captured 3D. And then the gameplay demo begins and everything's right with the world.